Egypt is remembered around the world for the events of the “Arab Spring” of January-February 2011, centred around Tahrir Square which saw President Mubarak stand down. Since then there have been further upheavals and a continuing insurgency in the Sinai Peninsula. Social unrest remains a problem, and the economy has failed to grow sufficiently to support the country’s rapidly growing population. Corruption is also a widespread problem, for example Reuters detailed in 2016 how the Egyptian government’s wheat supply chain was riddled with corruption, from fraudulent wheat purchases by local suppliers to hacked smart cards that allowed bakers to steal flour. This report was confirmed in August 2016 by a parliamentary report that stated that, “There are obvious flaws that rise to the level of complicity in the supply ministry and all of its bodies supervising the wheat procurement system.” Wheat is a major problem for Egypt, the price of wheat is subsidized in order to feed its population. Egypt is the world’s biggest wheat importer and the General Authority for Supply Commodities (GASC) of the Ministry of Supply and Internal Trade of Egypt (MoSIT) alone is the world’s biggest wheat purchaser. The FAO noted in 2015 that, “The Egyptian Government is heavily involved in the wheat value chain at all levels. Not only does it import more than one-third of all wheat imported into Egypt and represents the sole purchaser of domestic wheat, but it also owns an important share of storage capacity and more than half of the milling capacity of the country.” In particular the Government ensures the supply of heavily subsidized baladi bread to the population, a third of whom are below the poverty line. The cost of the baladi bread programme was about EGP 11 billion (USD 1.815 billion) p.a. in 2011/12. The bread subsidiary programme is therefore very expensive, in the financial year 2014/15 Egypt spent $5 billion on its subsidized bread programme. Wheat is central to the maintenance of the Egyptian state, the Bread Riots of 1977 killed scores of people and high bread prices and related shortages were a factor in civil unrest in 2007, 2008 and 2011. It is not an exaggeration to say that the survival of Egyptian Governments is dependent on the supply of bread to the masses. The behaviour of the Egyptian Agricultural Ministry and the GASC during 2016 have also highlighted the failures of Egyptian bureaucracy. In 2016 the Agricultural Ministry banned the import of wheat with any ergot fungus, a higher standard that required by other international purchasers, these requirements also contravened GASC’s tender specifications, which limited ergot to no more than 0.05%, which was in line with the Codex Alimentarius’ standard. As a result wheat cargoes have been turned away from Egypt and suppliers have refused to tender for supply, on the 31st August 2016 only one company tendered to supply, and the tender was cancelled (the fourth time that this had happened in the year). The US Foreign Agricultural Service, concluded, “These burdensome inspection and phytosanitary requirements add a premium to an already burdened economy that ends up eating away at the country’s precious foreign exchange, while saddling its consumers with higher food costs. It is in Egypt’s best interest to revise these standards and bring them in line with those of the global trading community.” The costs are higher because the only suppliers prepared to bid have put a premium on the normal world price for wheat to compensate for the risk of cargoes being refused by the Egyptians. Wheat, or rather bread, therefore serves to encapsulate Egypt’s problems; a growing population, water stress, salinity in farmland, climate change, corruption, incompetent bureaucracy, foreign exchange issues, wastefulness, and the fear of social unrest. As noted previously, Egypt’s economy is one of the most vulnerable to sea level rise, and it is estimated that a one metre rise in sea level would take approximately 12.5% of Egypt’s agricultural land, and reduce its GDP by over 6%. I have also referred to David Montgomery and his concerns that irrigation, facilitated by the Aswan High Dam, has resulted in water logging of soils and subsequent salinization. 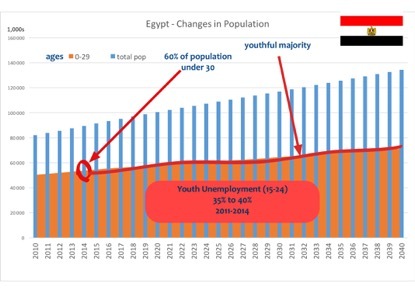 The stresses imposed on Egypt by climate change, population stress, and poor governance are likely to worsen in the 21st century, it is the largest Arab state and arguably the one under the greatest stress, apart from Yemen. (c) Andrew Palmer 2016, not to be reproduced.